by the Hartford Institute for Church Research, retrieved from http://hirr.hartsem.edu/research/fastfacts/fast_facts.html#sizecong, 11/9/16. A: For years, the Gallup Research Organization has come up with a consistent figure — 40 percent of all Americans, or roughly 118 million people, who said they attended worship on the previous weekend. Recently, sociologists of religion have questioned that figure, saying Americans tend to exaggerate how often they attend. 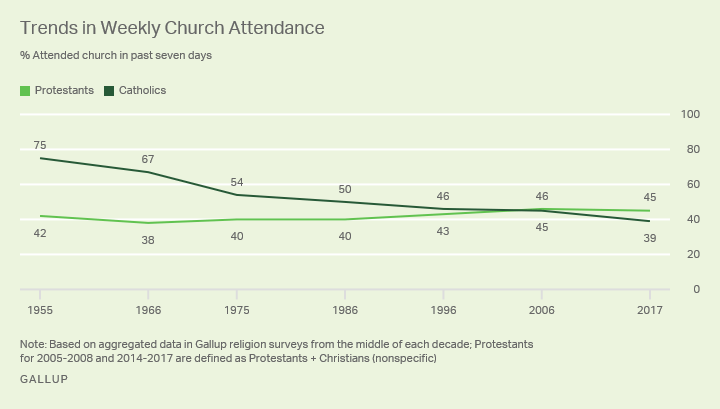 By actually counting the number of people who showed up at representative sample of churches, two researchers, Kirk Hadaway and Penny Marler found that only 20.4 percent of the population, or half the Gallup figure, attended church each weekend. As added proof for the accuracy of this smaller percentage of churchgoers, if 20.4% of Americans (approximately 63 million in 2010) attended the nation’s 350,000 congregations weekly then the average attendance would be 180 people per congregation which is almost exactly the figure that numerous research studies have found. For an excellent summary of this research, read the May 6, 1998 article by C. Kirk Hadaway and P.L. 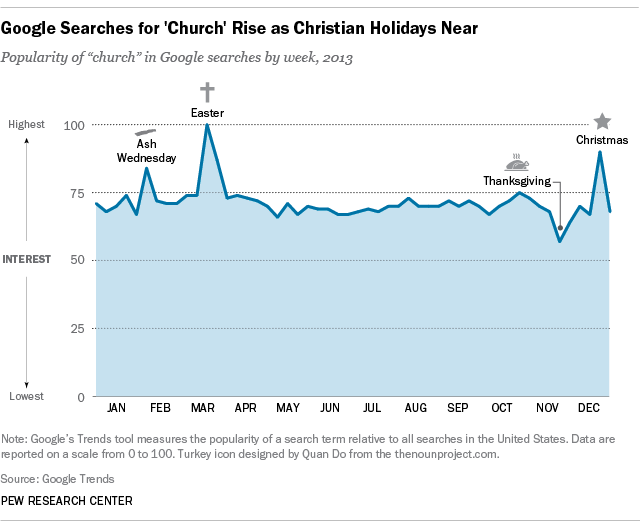 Marler Did You Really Go To Church This Week: Behind the Poll Data, in The Christian Century, http://www.religion-online.org/showarticle.asp?title=237. by Aaron Earls, Facts & Trends, 3/21/16. For couples looking to increase their chances of a lasting marriage, research offers some advice: don’t live together before marriage, but do attend church together. Researchers at the National Center for Health Statistics examined marital history data from the National Survey of Family Growth to determine what factors into the probability of a lasting first marriage. Couples who live together before getting married have a lower chance of having a long-term marriage than those who don’t live together, according to analysis by researchers at the Pew Research Center. A woman who refrained from living with her husband prior to their wedding has a 57 percent probability her marriage will last at least two decades. Those who cohabitate decrease their probability to 46 percent. For men, the more commitment is made prior to living together the more likely their marriages are to last. Those who live with their future spouse before even being engaged have the lowest chance of a long-term marriage at 49 percent. For those who wait until after marriage, they have a 60 percent chance of celebrating their 20th wedding anniversary. Commentary by Dr. Whitesel: The following list was put together by my seminary students from experience and research (and to fulfill a leadership exercise you can also use, access it HERE). I think you will agree with me that it is an eye-opening list. > Keep at this size by …. Maintaining what is already “good,” coasting along on old vision, setting values that reflect being “mediocre” is good enough (Northouse, 2012). by Bob Whitesel, D.Min., Ph.D., 9/18/15. Here is an exercise I conduct with my students, which makes a good exercise for judicatory leaders and pastors’ meetings. It helps leaders see how leadership styles must change as the organization grows. Remember, if you don’t change your leadership style, your style will usually stunt the growth of the organization (and decline it back to the smaller size that matches your leadership style). 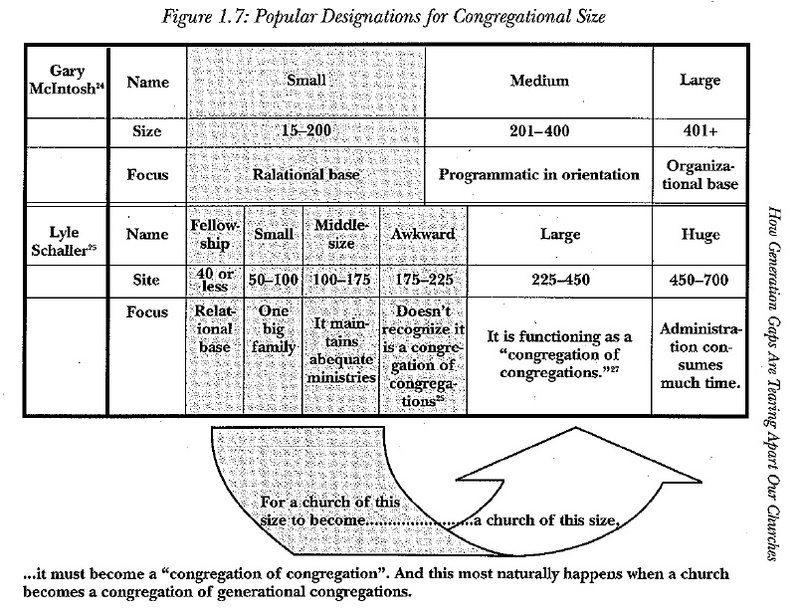 First, let’s look at some popular size designations for churches (CLICK TO ENLARGE the attached comparison from Whitesel, 2000, p. 29). I like to use Lyle Schaller’s designations (1981, pp. 17-63). But, I also appreciate Gary McIntosh’s emphasis various designations for church size (1999, pp. 17-19). This exercise only requires four to eight sentences. Each person adds a few lines about effective leadership traits, abilities and/or skills (Northouse, 2009, pp. 1-3) for one or two size ranges. For the size(s) you choose, participants will give us a couple lines about leadership characteristics that will keep the church at this size, and a few lines about leadership characteristics that can grow it out of this size. The following are the size ranges of Sunday morning attendance. Just cut and paste the ranges (in your postings if you are a student) and add your insights. > Keep at this size by …. > Grow out of this size by …. That’s it. Take a couple of these sizes and add a couple lines about leadership characteristics that will keep it in this size range, and then a few lines about leadership characteristics that will grow it out of this size. > Keep at this size by …. Pastor makes all major decisions her or himself, creating a bottleneck of decision making. > Grow out of this size by …. Pastor apprentices gifted laypeople in ministry, supports publically their decision making, but may offer confidential critique. Hunter, G. G. III (1979). The contagious congregation. Nashville, TN: Abingdon Press. Northouse, P. G. (2009). Introduction to leadership: Concepts and practice. Los Angeles, CA: Sage Publications. McIntosh, G. L., (1999). One size doesn’t fit all: Brining out the best in any size church. Grand Rapids, MI: Fleming H. Revel. Whitesel, B., & Hunter, K. R. (2000). A house divided: Bridging the generational gaps in your church. Nashville, TN: Abingdon Press. by Warren Bird, Leadership Network, 7/6/15. “As the Baby Boomer generation (born 1946-1964) passes on, megachurches are also dying off.” I see statements like that often in the public media, but all the evidence says they’re just plain wrong, based on a major research project I did with Scott Thumma. Instead, the larger the church the greater the percentage of young adults go there on average. We found and wrote in Not Who You Think They Are (free download) that the average age of megachurch respondents is 40 years old, similar to the U.S. Census average. Yet the average age of an attender in a typical “non-megachurch” congregation is nearly 53 years old. Nearly two-thirds (62%) of megachurch attenders are under 45 years old, while only a third are that young in other size churches (35%). … In addition, nearly half the singles in megachurches have been at the churches 2 years or less, but 20% of them have attended six years or more. Interestingly, these single attenders were twice as likely to be living with other singles when compared to churches of other sizes (16% vs. 8%) but equal in percentage for those living alone (16% vs. 15%). This suggests that perhaps a large percentage of the megachurch singles are students, a perception confirmed in our visits to the megachurches. The visitors and newer people at the megachurches were even more likely to be youthful and single than were those to the average church. Almost 60% of single, never-married megachurch attenders are visitors or have been at the church 2 years or less, whereas for all churches 40% of never married people are visitors or are recent church attenders. For other blogs in this series see here and here (scroll down to “FAQs about North American Churches”).